Coming into Thursday night’s game against Monmouth, junior Ike Azotam was the only player on the Quinnipiac men’s basketball team averaging double-digit scoring numbers, with 13.9 points-per-game. Thursday night against Monmouth was far different for the Bobcats offense. Led by four double-figure scorers and timely defense, Quinnipiac (10-13, 6-5 NEC) defeated the visiting Hawks by the final of 79-63 at the TD Bank Sports Center. With the victory, Quinnipiac has taken four of their last five contests. Azotam and Shaq Shannon paced the Bobcats with 18 points apiece. Sixteen of Azotam’s 18 points came in the first half, where he shot 7-of-8 from the field. Shannon also added six assists and four rebounds to his credit. The Bobcats opened the game up on an 11-0 run in the first 2:44, a lead they did not surrender throughout the night. The other two scorers who succeeded 10 points were Evan Conti and Ousmane Drame. Conti knocked down 11 points, while Drame, starting for the injured Jamee Jackson, contributed 12 points to go along with nine rebounds and five blocks. 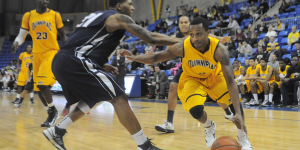 Quinnipiac shot 58.6 percent on the night, and held the visiting Hawks to 41.1 percent. Quinnipiac also outrebounded Monmouth (9-15, 3-8 NEC) 32-29. Going back to 2011-12, the Bobcats have now won 24 straight games when winning the battle on the glass. With the win, they are 15-13 all-time against Monmouth, winning their last six matchups. The Bobcats next test is Sunday when they will travel to Central Connecticut. Tipoff is slotted for 3:30.